This event is open only to the NYU Law community. 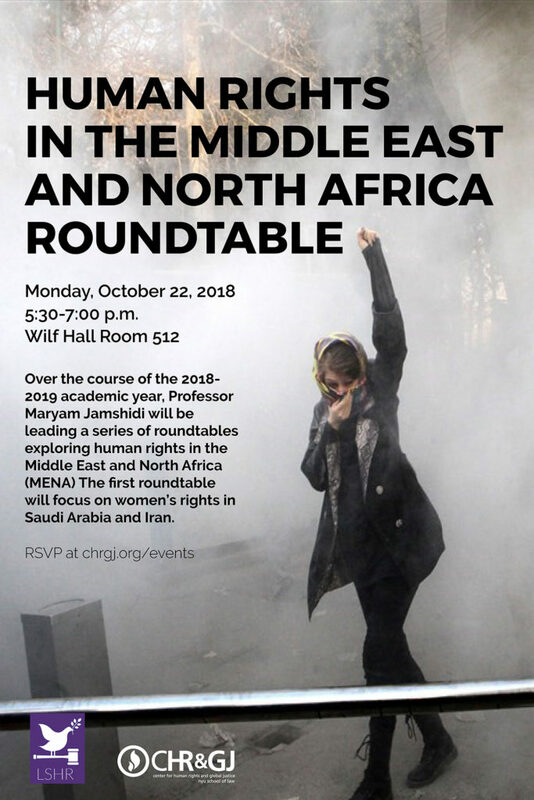 Over the course of the 2018-2019 academic year, Professor Maryam Jamshidi will be leading a series of roundtables exploring human rights in the Middle East and North Africa (MENA). Through the use of region-specific case studies, the series will examine the MENA region’s relationship with human rights as reflecting problematic trends endemic to the global human rights system, while also gesturing towards possible solutions. Prevailing tropes about human rights in MENA will be critiqued, without taking away from the real obstacles facing human rights in Middle Eastern and North African countries. Many of the lessons learned from these discussions will not only apply to human rights inside the region, but also globally. To participate, please RSVP here by October 16. Participation is open to all members of the NYU Law community, including students, staff, faculty, visiting scholars, and administrators. Space may be limited if we reach room capacity. The series is co-organized by the Center for Human Rights and Global Justice, Law Students for Human Rights, the Middle East Law Students Association, and the International Law Students Association.